Before I get into the details of this one, I need to explain that there’s two different ways of looking at this movie. You can either view it as a standalone piece, or you can compare and contrast it to the anime. Throughout this I’ll try to use both perspectives, one at a time. I actually finished the anime about a week before the movie came out. Good timing I suppose. Anyhow, let me start with a bit of background for those who might be interested or don’t know anything about Death Note. Originally starting as a manga (comic series) in Japan, Death Note rose in popularity due to its unique premise and the now famous mind games that its main characters participate in. In Japan, the series was spun off into an anime, a live-action TV show, and various feature length movies. Over time the manga and anime grew in popularity stateside. Everything else, save for a small theatrical releases of the live action films in 2008, seemed to stay in Japan. That is, until Netflix announced that they were making a new English live-action Death Note. With the manga selling more than 30 million copies worldwide, there was an obvious market for the film. And people were EXCITED! The unique characters and genius level mind games of this beloved series combined with Willem Dafoe as Ryuk? In English? Even I was a bit excited at the possibilities! …Then the movie came out. Now I can’t go much further without explaining the basic story of Death Note so SPOILERS AHEAD! Death Note (the anime/manga series) is about a high schooler named Light Yagami who comes across a book called the ‘death note’ that claims it can kill anyone whose name is written in the book. There are some rules that go along with the book as well, and the book’s keeper (a demon-like creature named Ryuk) appears soon after Light makes his first kill using the book. Ryuk lets Light hang on to the book, mainly because he’s bored and Light’s use of the book only helps him. With the book and his intellect, Light takes on the persona of ‘Kira’ and kills criminals while simultaneously dodging capture from authorities worldwide who fear his unknown power. The Netflix movie follows much of the same structure: Light (played by Nat Wolff) gets the book, meets Ryuk, becomes Kira, and tries to evade capture. Seems like an intriguing setup right? Well, movies aren’t just their premises. The characters have to be memorable somehow to make something truly great. Think about a movie like The Purge. What do you remember about it off the top of your head? I couldn’t tell you the name of a single character in the movie, but the rules of the actual purge stick in my head to this day! It was a film that had an interesting premise, but it was followed up with bland, uninteresting characters. Death Note has the same problem. beat down. (Light reminds his bully that he’s 18 while Light isn’t, so beating him up would be considered assaulting a minor. Technically true, but bullies don’t usually change their minds over technicalities do they?) These books smarts, however, don’t play a role at any point in the rest of the film. You’d think that something that is so heavily established at the beginning of a film would play an important role later on but, nah. Eventually, Light gets the death note and meets Ryuk in one of the funniest scenes of the movie. It’s not meant to be funny, but that makes it even funnier. Even though I didn’t like this movie I still occasionally look up this scene on YouTube so I can laugh at it again. So, what does our high school hero decide to do with the book? Well after killing the bully that picked on him and the man who killed Light’s mother and got away with it, he brings it to school and shows a girl that he talked to literally once before in his entire life how it works and kills someone to prove it. This makes her… fall in love with him instantly. It was around this point that I realized that this movie wasn’t going to crawl its way back out of the hole of generic characters and bad acting it’d been building up to this point. Let’s talk about every other character in the movie for a moment. The girl that Light shows the death note is named Mia (who is played by Margaret Qualley) and she is a little more interesting than dried out silly putty for most of the movie. She has a sadistic streak that builds up throughout the film and becomes a major point in the movie’s last ten minutes, but besides that she does generic things that the ‘outsider kid who no one hangs out with even though she’s a conventionally attractive cheerleader’ always does. She gets mad and fights for control of the death note multiple times, which I think is meant to come off as a threat to Light, but instead it feels like she is whining about every choice he makes. Her whine fests only happen because Light decides to become a dumber, concerned child as soon as authorities get a whiff of his scent. Then there’s L (played by Lakeith Stanfield). L is the alias of the lead investigator of the worldwide hunt for Kira. He is methodical, quirky, and not afraid to take risks in his pursuit of criminals. Without a doubt L was one of the best things about this movie. He was a great antagonist, had personal struggle, and made it seem like there was always pressure on Light. Though he kind of falls apart in the last act of the movie after his interesting-as-normal-silly-putty assistant Watari (Paul Nakauchi) is killed. Once L abandons his principles and calm rational thought he becomes unpredictable much less interesting. In fact as I write this, it occurs to me how many characters suddenly veer away from their normal actions in the last third of the film. L goes from calculated to straight up chasing Light down the street, Mia goes from being deeply in love with Light to planning his murder so she can control the death note (then back to being in love with him, then back to wanting to kill him), and Light goes from being a complete imbecile to planning out a complex series of steps in two minutes that simultaneously kill three people, save his life, destroy a ferris wheel, and keep the death note a secret! It’s almost as if Light was initially written as a mastermind initially then had to be dumbed down over and over in script rewrites so that his actions fit within the confines of the film’s time limit. y name and lived’. A cool line, but it’s unfortunately undercut by the fact that someone did write his name in the death note already as a warning (it says “don’t trust Ryuk” in the margin of one of the pages when Light first opens the book). Ryuk served as a constant reminder that supernatural powers come with a supernatural price, and generally made the film more enjoyable. Now, before I move on to talking about the movie when compared to the anime I want to talk about some things that this movie did right. I feel like this article needs a change of pace from me tearing Light a new one nonstop. First and foremost is the death scenes. They are a bit on the cheesy side with blood explosions, but their bit of campiness adds a certain flair to each death that kept things visually interesting. Second of all, Ryuk’s design was phenomenal! Keeping him in a more classic look makes him stand out as a supernatural force, and gives his character real presence. Third, setting up the stakes. Though this movie was more of a teen love story than the psychological thriller I went into it expecting, the reach of the death note’s power and its global impact were established in a generic but satisfying way. Now let’s compare to the anime. If it isn’t clear from what you’ve already read, I don’t think this movie does the anime justice. As a standalone movie, Death Note is kind of bad. Compared to the anime series, it’s nearly unwatchable. It’s hard to watch something based off of a series you really enjoy and not compare the two. characters, and play mind games. Sure this leads to some long shots with small camera movements where we just hear a character’s inner monologue for a bit, but it was still engaging! I think that if this movie was made into a mini-series it could have told a much deeper, more complex story and still keep the feel of the anime. Some of the changes that the movie made make sense: Light’s mother being dead gives him motivation to continue killing, and there was definitely no way that the movie could fit in all the stories of people involved with the hunt for Kira (including, thankfully, L’s replacements). But then there’s some changes that just don’t make sense when you think about it. Like, why can’t other people who touch the death note see Ryuk? Ryuk and others like him were always invisible to all but those who had touched their death note in the anime. Their sudden reveal when someone touched their book gave characters a scare, and helped them come to terms with the fact that they were dealing with the supernatural. Meanwhile in the movie Light looks like a raving lunatic to everyone when he talks to Ryuk, including his girlfriend who believes him! Sure this builds up the isolation he has as the book’s owner, but it also takes one of Light’s psychological pawns off of the table when it comes to manipulating others. Oh wait, Light isn’t a tactical genius in the movie. I guess I answered my own question on that one. Another change in the movie that is being debated by people is how most of the characters are a different race then they were in the anime. I don’t particularly see a problem with that in this film, solely because this was meant to be an American telling of the story. And it’s clear that with some of these changes (particularly, L’s character) that an actor was chosen based on an ability to fit the role better than anyone else. The most disappointing change in this entire movie however has to be how Light’s personality and mannerisms were changed between these two works. I feel like I’ve talked enough about how I don’t like Light in the movie, and I think a large part of that is the fact that I couldn’t believe that this was supposed to be the same character as the anime. In the anime, Light is cold. He is calculated, secretive, manipulative, and has an amazing poker face in all but the most extreme situations. This cold calculation is how he survives as Kira. It’s how he joins the Kira hunting task force and avoids suspicion. If he’s showing any emotion, it’s usually a feigned happiness or emotional attachment to those around him. In contrast, movie Light is quick to show frustration, is horrendous at averting L’s suspicious, and SHOWS A GIRL THE DEATH NOTE THE DAY AFTER HE GOT IT BECAUSE HE THINKS SHE’S HOT! Not to mention the fact that he had it out at school, without so much as a book cover on it to stop people from asking why he’s reading and writing in an old book that says ‘Death Note’ on the cover. Save for those he is going to kill with the book, he never manipulates those around him either (the one exception being his dad, who believed that Light wasn’t Kira from the beginning). Light’s calm manipulation was a staple of his character in the anime. In this movie, It’s an endangered species at best. The last change that’s worth talking about is the genre shift that between anime and movie. The anime version of Death Note, as I’ve mentioned a few dozen times, liked to play up the psychological angle of the ramifications of having a notebook that can kill anyone. I think it’s safe to classify the anime as a thriller: the audience held their breath as they waited to see how investigators would react to new information and Light’s traps. The movie keeps this in a simplified way, but it feels like more of a subplot. To me, the movie feels like a low to medium budget horror movie without the horror part. It has excessive and intentional gore, creepy locales, and a cinematography style that reminds me of movies about slashers following around high schoolers. It tries to be both a thriller and a horror movie, but doesn’t really succeed at either. Heck, has a long chase scene in the style of an action movie near the end as well, but up to that point of the movie there was nothing to suggest that something like that would happen! Do you really think that two characters who are known for their intellectual prowess (in the anime at least) would get into a footrace around town? With one of them waving a gun around despite saying that he doesn’t use guns at all? The footrace again makes the movie feel like the script was lazily getting there and the film was running out of time so… he got there in a convenient way. When it comes down to it, I wasn’t a big fan of this movie. If you’re into low budget horror movies with an intriguing premise, there might be two or three scenes in this movie you’d enjoy. For anyone who doesn’t want to endure an onslaught of bad acting and hasty world building that’s wrapped up with an out-of-character ending sequence, I’d suggest you watch something else. 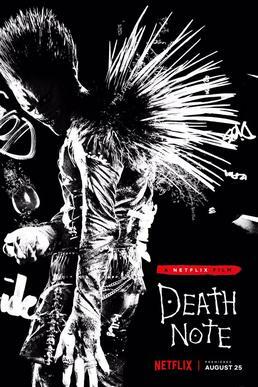 Or hey, if you’re looking for an intense psychological thriller, check out the Death Note anime on Netflix! The first twenty-seven episodes are phenomenal. It goes a bit downhill after that. With all of that said, I rate this movie 2 out of 6 reels.